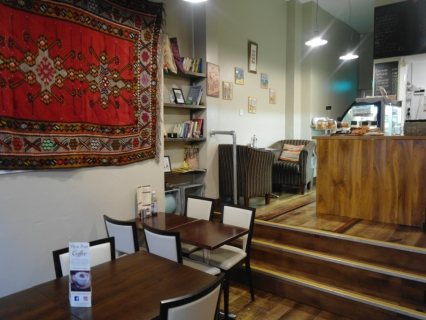 Central Business Sales is delighted to offer to the market a rare opportunity to purchase a thriving city centre cafe. The 24 cover cafe is in excellent condition, having been recently refurbished to a very high standard. The owner has quickly built up an excellent reputation and has a large repeat trade as well as a high passing trade due to its city centre location. The cafe is also very busy with the large number of tourists who visit the area on a daily basis. The cafe offers a freshly prepared menu including a full breakfast, hot and cold filled rolls and sandwiches, wraps, toasties, teas, coffees and soft drinks. The menu is available for sit in and takeaway. There is potential to expand the business to offer outside catering to the many offices that are located in the area. The premises are approximately 70m² and are in excellent condition throughout. The single front entrance leads into the main seating area. There is a mezzanine level with a large serving and preparation area. There is also a good sized fully equipped kitchen to the rear with further seating. The business is being offered on a leasehold basis with 8 years left on the current lease. The rent is £200 per week and 100% rates relief applies under the Small Business Bonus Scheme. The cafe is open 08:--16:00 7 days a week, with potential to open in the evenings. The cafe is run by the owner and 2 part time employees.